A marketer’s paramount objective is to generate high quality leads at a pace to sustain business growth. Successful online lead generation keeps the sales funnel primed with the right prospects, but surprisingly, only 1 in 10 companies feel their leadgen campaigns are effective. Lead generation campaigns commit to a precise promise. Whether offering a piece of content, a phone consultation, or a great new deal, the campaign offer is a commitment. And if you don’t deliver on that, you alienate the very prospects you want to attract. There can be a lot of moving parts in an online lead generation campaign, and it’s often difficult to know which ones need fine-tuning. So what goes into a good campaign? First, let’s review the 2 basic drivers. 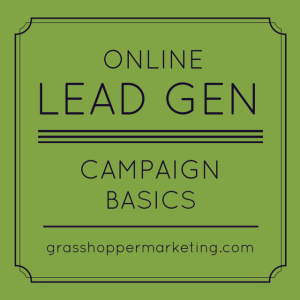 What’s the reason for your leadgen campaign? While it might seem obvious at first, getting goals confused can lead to campaign designs that do something unimportant, or even counter-productive. Do you want to educate your customers? Do you want to drive new leads or nurture existing prospects? Once you decide, be specific with your success metrics – if you want higher sales, by how much? If you want to go viral, how many views would be a win? Knowing the goal and how you measure it will help both drive tactical design and guide improvements in later campaign iterations. Good campaigns segment audiences and target content accordingly, using factors like age, industry type, and buying-cycle stage. The ability to target buyer personas effectively relies on the quality and accuracy of your data, along with the marketing tools you use, such as your marketing-automation platform. From a tactical perspective, a marketer needs 4 crucial elements of effective inbound lead generation, and the best lead gen campaigns contain most (if not all) of them. An offer is something perceived significantly in value. From a lead gen perspective, they include eBooks, whitepapers, free consultations, price discounts and product demonstrations. And when that something is relatively exclusive, scarce, or in high demand, it becomes more desirable and can overcome a lead’s indecision. Why do these offers work? Because they trigger a reaction that makes an offer more valuable. Prospects must perceive the value of your offer to be greater than what you’re asking in return. The higher the perception of value, the more irresistible the offer. So how do you create irresistible offers? People who click on any marketing message you send should be directed to a customized landing page for that message. In other words, your landing page should be customized for the needs of every campaign you launch. If you’re announcing an upcoming event, your landing page should only highlight details of the event. If you’re launching a new eBook, your landing page should summarize the content readers will find. If you’re sharing a new deal, your landing page should only detail what the value of the deal is. Sending users to your homepage will significantly increase drop-off rates because they have no idea where to go once they arrive. A customized landing page solves that problem. According to MarketingSherpa’s research, landing pages are effective for 94% of B2B and B2C companies. The use of landing pages enables marketers to direct website visitors to targeted pages and capture leads at a much higher rate. What’s great about landing pages is that they direct your visitors to one particular offer without the distractions of everything else on your website. Visitors are on a landing page for one and only purpose: to complete the lead capture form. For more information about landing pages, click here to READ OUR FULL LANDING PAGE POST HERE. Once the visitor arrives at the landing page, you can further promote your campaigns, drive sales, and capture visitor information. The call-to-action (CTA) plays a critical role in converting site visitors to leads. CTAs help trigger the prospect to convert. By clicking through a CTA, your prospect is pulled down your funnel – prospect to lead, and lead to customer. To influence such conversions, add CTA buttons to all your campaigns. A CTA is the button a website visitor clicks, which funnels them through the next step on your overall site conversion path. These CTAs can come in the form of linked text or images. CTAs can help conversions on every stage of the funnel. For example, a CTA on a product landing page can bring people to your company shopping cart, while a CTA in an email can bring your subscribers to a new landing page to collect more detailed information. In this sense, CTAs are an essential part of your tool kit, the driving force behind moving people along in your campaign. Your website isn’t a silo. Marketers must utilize many other channels in order to maximize their lead generation efforts. In this sense, a channel might be a retail store, a website, a social media platform, an email, or a text message. The objective is to make it easy for buyers to research, evaluate and purchase products in a way most appropriate for them. It’s all about having the right marketing mix. According to HubSpot’s recent Benchmarks report, companies that blog 6-8 times per month double their lead volume. This proves blogging is a highly effective channel for lead generation. In every blog post, include hyperlinks to landing pages within the copy of the post, as well as a prominent call-to-action. Despite introduction of social media and blogs, email remains a core driver of onlinw lead generation. Email marketing allows you to, over time, create a true database of (loyal) contacts. All the people who follow through on your calls-to-actions, and all the people who fill out the forms on your landing pages, will be added to your contacts database. You can then target these contacts for appropriate email communication. Rather then sending your entire contact list one generalized email, you can send the right targeted message, to the right person, through targeted email. Before you think DM is dead (or dying) consider this: as email and social media in boxes fill up, mail boxes are a little more empty. Maybe you’ve developed a content asset for high-level executives who don’t usually browse the web and have cluttered email inboxes. If so, direct mail correspondence can stand out. If your marketing automation software and CRM system has a direct mail application, you can track your direct mail from the moment the vendor creates the package to when it hits the prospect’s desk. But know that in today’s digital marketing world, direct mail campaigns need to be innovative. Don’t send a postcard with a clunky marketing message—make your direct mail campaign targeted, and make it pop. Don’t use the same messaging in a direct mail campaign to CEOs that you’d use for a marketing practitioner. The same buyer persona customization rules hold for ALL marketing channels, young and old. Whether hosting a small private function, a large-scale international tradeshow, or an executive-level webinar, event marketing can be an integral part of your lead generation mix. Events offer you the chance to define your brand, clarify the solutions you provide, establish personal connections with participants, and give your prospects and customers the chance to interact with each other. As every marketer knows, there’s no better advertising than the direct words of a satisfied customer. Events can also convey your company’s thought leadership and vision through speeches, content assets, and presentation style. Webinars can help you generate new leads and nurture known leads, especially when they educate. Many companies fail to produce quality webinars that map to early or mid-stage leads, focusing instead on webinars that are very product or service-centric. Instead, educate your audience about the benefits, considerations, risks and fine detail surrounding your product in general. Don’t try to make the sale before your audience trusts you. Yes, social media can rock for generating interest and leads. But as audience get smarter, you have to offer quality content and offers, or get passed by competitors that do. Build a loyal following. Building a relationship with potential customers is a critical first step. Social media connections are really about people-to-people, not always company-to-individual. Get to know your audience online, communicate and share information. Remember, it’s one big sand box, so don’t be a bully. Listen, converse and make loyal friends first. Social media is a dialogue. Companies that only use social media to blast out messages about themselves aren’t using social channels effectively. The goal is to interact with others and be helpful. When you share content on social media, don’t always post something that relates to your company. Share links to other interesting things related to your company’s world. Be AGNOSTIC! This builds trust, rather than cynical mistrust. While promoting your offers in many channels is crucial for lead generation, it’s also equally important to make it easy for people to find your landing pages through search engines. To do this, you need to apply search engine optimization (SEO) best practices to your landing pages. Pick a primary keyword phrase for each landing page and focus on optimizing that page for that phrase. If you over saturate a page with too many keywords, the page will lose its importance and authority because search engines won’thave a clear idea of what the page is MOST about. The actual tactics to rank well are ever-changing, so the best way to get your tactics right is to keep up with how Google and other search engines rank (which is extremely hard to do when you’re busy running your business) OR find a good SEO provider, one with a great longterm reputation that doesn’t use shady tactics, and sit down and talk with them about your goals for SEO. The final component in your new marketing campaign strategy involves reviewing your campaigns with analytic tools. Which campaigns were the most successful? How do you prove the value of each campaign? The beauty of online marketing is that every action your visitors take can be tracked and stored somewhere – this represents a tectonic shift for marketing strategy. Rather than relying on your gut to decide how well your ideas are working, marketers can now use data to dissect campaigns, and glean true ROI insight. How well your campaigns convert visitors and leads? How specific marketing campaigns are faring compared with one another? How effectively your campaigns are delivering ROI and revenue? The specific metrics that will best predict your online lead generation campaigns effectiveness will vary by your business and target market. For a complete picture of how your campaigns are faring, be sure to look at a variety of measures, including traffic, submission and conversion rates, raw data such as total new leads, engagement by channel, and comparative metrics such as new leads/contacts. Generating leads online has the power to improve your marketing. Using great offers, calls-to-action, landing pages and forms – while promoting them in multi-channel environments – can reduce your cost-per-lead while delivering higher quality prospects to your sales team. This post contains best practices for many aspects of lead generation to help bolster your conversion rates, but these basics are just the beginning. Continue to tweak and test each step of your online lead generation process in an effort to improve lead quality and increase revenue.